Allie: oooh! 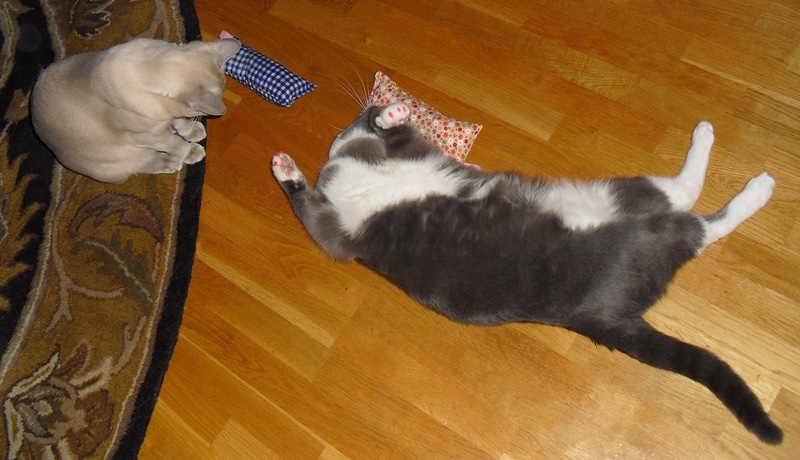 Our Silvervine Pillows came from Nip and Bones! This pink one is *just* what a girl needs! Faraday: Allie, I'm worried about you. I really am. 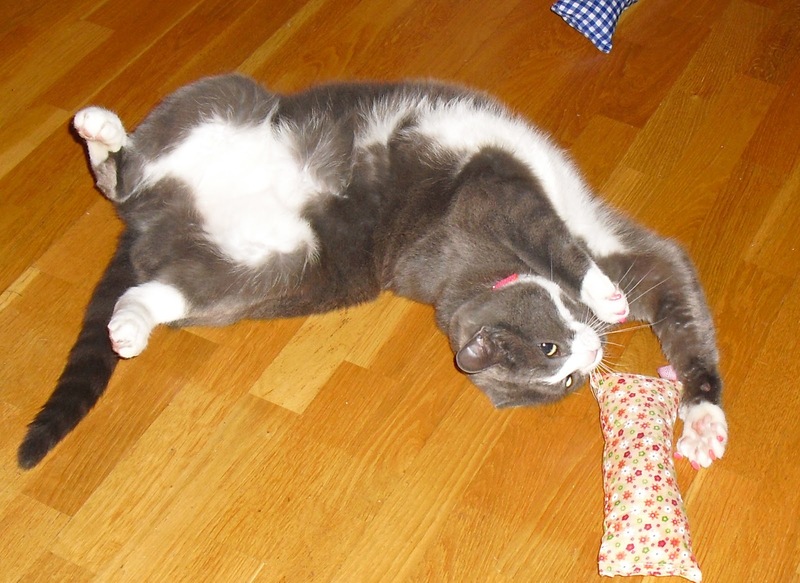 Catnip and Valerian Root each have ONE active ingredient that make cats go batty. But apparently, silvervine has BOTH these ingredients so more cats tend to respond to it. Err...Faraday doesn't seem interested? FaRADaY:nah - I just like messin' wif Allie's head!! Allie: *blush* oh thank you!! We TOTALLY agree!! These ROCK! That is good stuff isn't it Allie. I agree with you. Looks like silvervine pillows make for VERY HAPPY cats! You wait! It’ll be rehab before you can say “let’s have a sniffter!" Allie: *giggle* oh I can quit ANY time...as long as it's tomorrow. That IS good stuff and Allie got the pink one! Worried? What's to worry - silver vine is awesome!!!! Oh yeah! That silvervine is da bomb!! Yep, we got ours last week. Sum of us like it, sum of us, don't. Weerd. Our kitties have never tried silverine. They don't like catnip all that much so we'll have to go back to Nip & Bones and order some! DEFinitely!! We give it two paws up!! Allie: *waggles pink toenails* HI Roo! We'll come over & check it out! Oooooh! We've heard SO much about these silvervine pillows! Want, Want, Want! They are so cute too...did you have a choice of fabrics or were they random? Maxwell: Momma didn't ask (don't tell Allie tho!!) but we just betcha Baby Patches would make her momma get a special color for you if you wanted (uhhh, lemme guess -- PINK?). Momma saved your pawsome pics for the gallery, she hopes to start updating it this week. It is furry outdated and we has tons of new ones to put in there. Glad you loving the Silvervine Allie, all of us kitties here luvs it and momma even put some powder on one of our toys today!